A billboard for a Northern California gun range is drawing controversy for featuring Santa Claus carrying an AR-15. 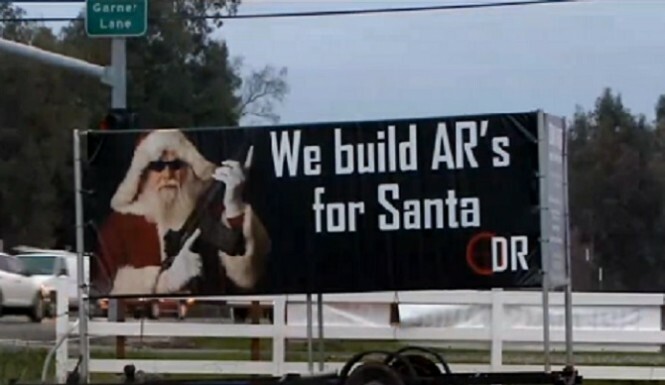 According to CBS Sacramento, the billboard for Down Range Indoor Training Center in Chico, California shows Santa with a gun and a tagline that reads: “We build AR’s for Santa.” Co-owner Steve Dyke said the local gun range had to come up with something creative to attract customers. An assault rifle, by definition, is a military style weapon designed for the specific purpose of attacking and killing other human beings. It is an instrument of aggression. Santa Claus, on the other hand, is a fictional character based on a Christian saint in the Catholic pantheon, Saint Nicolas of Myra, who lived in what is modern day Turkey (270 – 343 A.D). So, even if an assault rifle were appropriate for hunting deer…conflating Santa Claus with weapons of death and destruction is disturbing on a multitude of levels.